Whenever February comes around, I'm always in disbelief that we still have quite a bit of winter left to go. After a pretty mild holiday season, we just got hit with a major snowstorm out here - nearly three feet to be exact. I'm happy to report that my son finally headed back to school today, 11 days later (and my grocery budget is rejoicing.) The positive in being snowed in for so long was a chance to work on some hearty slow cooked recipes. 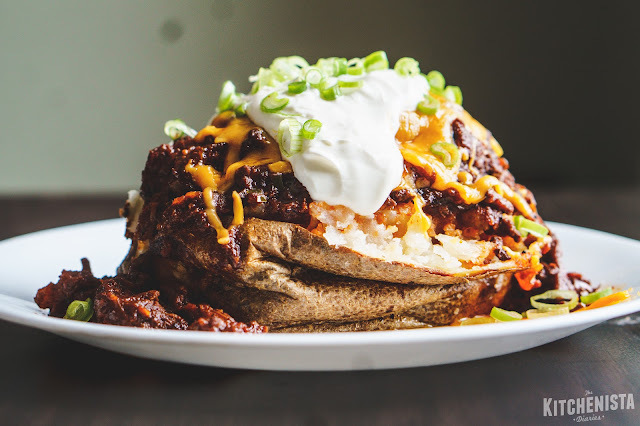 Chili is a comfort food classic, game day essential food and an all-around cold weather staple. 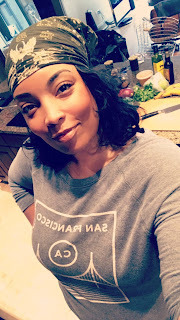 In my early days, making chili amounted to simmering browned ground beef, onions, garlic, tomatoes, all of the Mexican spices in my cabinet, some jalapenos, and a prayer. Sometimes it was good, but looking back it probably was never great. When I was ready to tackle a chili recipe for my blog last year, I wanted to make a great chili. My goal was to improve my technique, work with better ingredients and achieve a respectable depth in flavor. This wasn't an impossible task at all, but there were so many directions to consider. 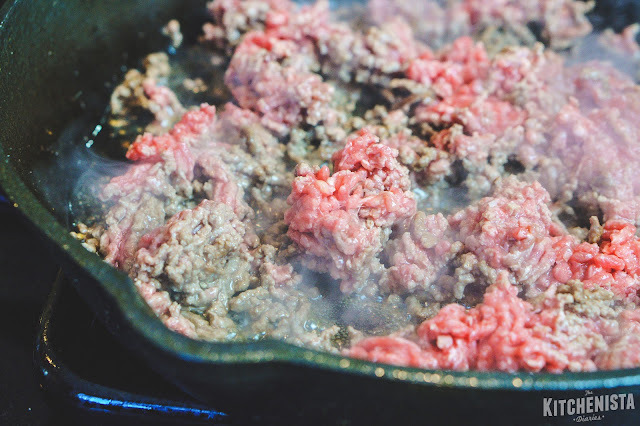 Should I stay in familiar territory with ground beef, or use a different cut for a chunkier chili? Did I really need to add bacon, beer, chocolate or other "secret" ingredients that award winning chili masters swear by? And would I dare betray my Texas roots and add beans? Eventually I stumbled across J. Kenji Lopez-Alt's recipe, "The Best Chili Ever" over at Serious Eats. It looked more promising than anything else I'd read and turned out to be a fantastic recipe. The biggest takeaway for me was starting with whole dried chiles instead of a ground chile powder. Chili is after all, all about the chile flavor so it made sense that a change here would have the biggest impact. 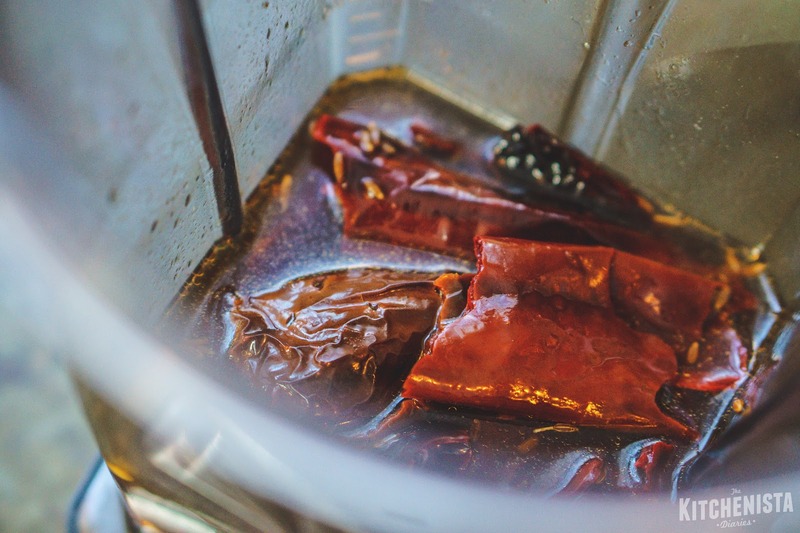 At that point I had already been making use of ancho and guajillo chile purees in many of my dishes, so I was a little surprised I hadn't thought of it myself! Another interesting aspect of Serious Eats' chili was the addition of umami boosters, notably anchovies and soy sauce. The two might seem out of place in a chili, but they simply work to enhance the meaty flavor of beef. (If you don't have anchovies on hand, Worcestershire sauce will work in a pinch.) As for the beef, I loved their version made with short ribs for its chunks of tender beef, but it made for a super expensive pot of chili. I also missed the texture of ground beef so I compromised with a combination of ground chuck and chuck roast. It's worth noting that I occasionally incorporate ground chorizo into this recipe but opted not to include pork in the final version. I wanted to celebrate that beefy flavor all on its own. 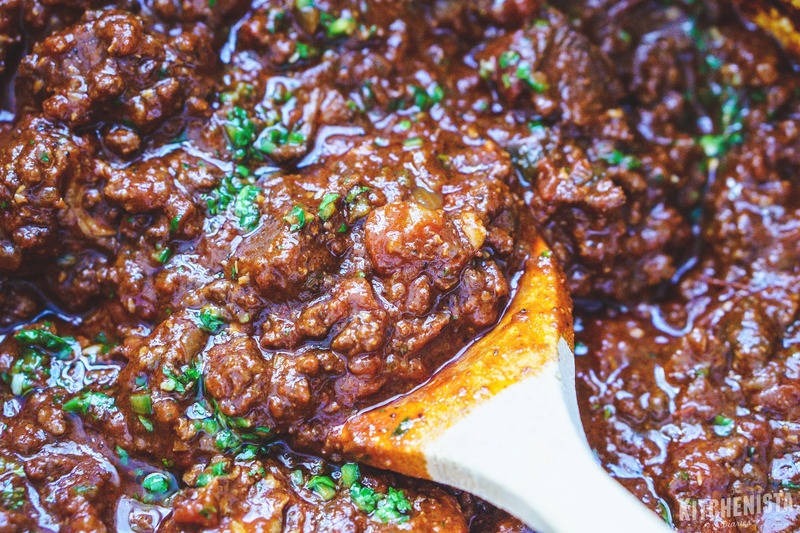 After testing variations of my recipe for more than a year, I settled on what I felt was my best version: a thick and spicy, chunky beef chili with a hint of cocoa, no beans. My special touch is a quick sofrito of serrano peppers and cilantro stirred in at the very end, to wake up those slow cooked flavors. Although we don't typically think of chili as health food, this one is pretty clean as far as ingredients go. 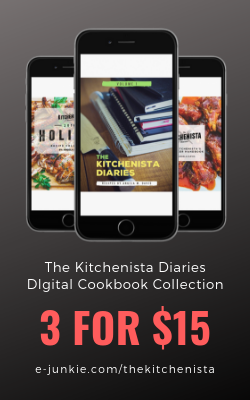 I've included a couple notes on how I modify it for Whole 30. 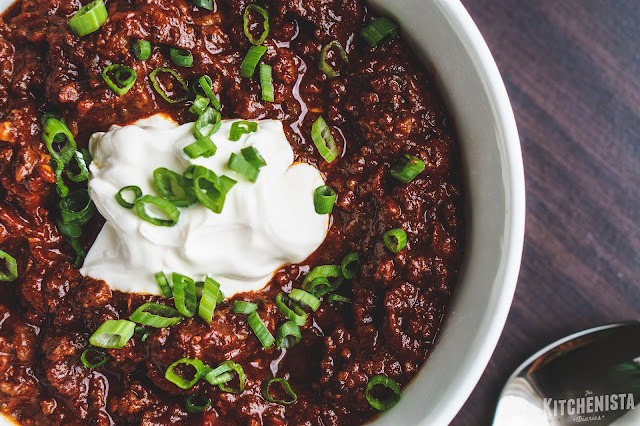 You'd have to eliminate dairy garnishes of course, but you'll find that this chili doesn't need much. The last pot I made was so good that I devoured bowls of the stuff with no more than a dollop of sour cream or diced avocado. 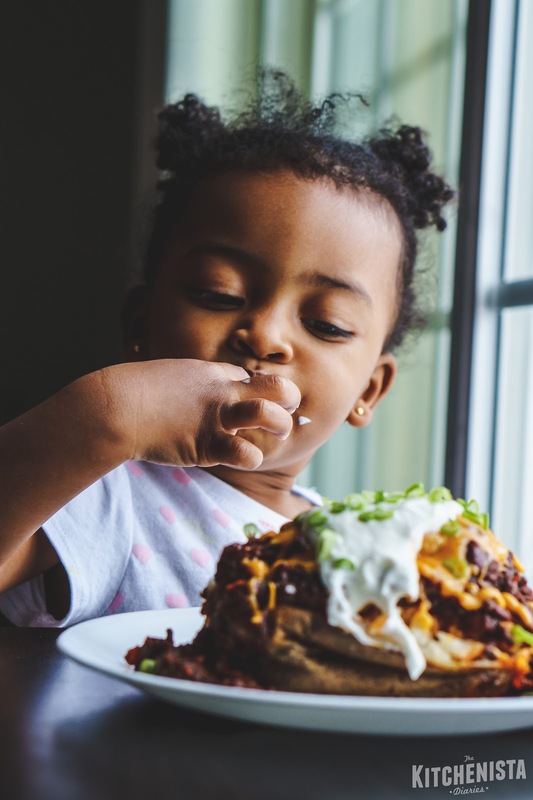 That said, if you're indulging I'd have to recommend ladling hot chili over a fluffy baked Russet potato and smother it with cheddar cheese (as you can see, it's even toddler approved.) 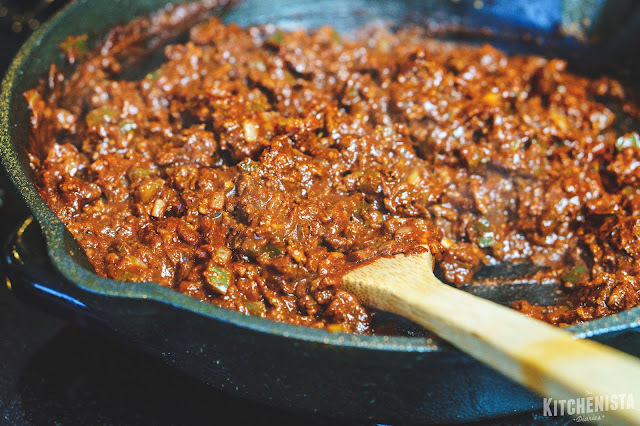 If you're a traditionalist, you'll never ever go wrong serving chili with skillet cornbread on the side. This isn't a difficult recipe to execute, but it is a rather long list of ingredients and needs time to work its magic in the pot. I've broken it into three parts - preparation of the chile paste, cooking the chili, and finishing with the sofrito. Consider it a cooking project for a lazy weekend and plan to make it a day before you need it (chili is always best the next day in my experience.) 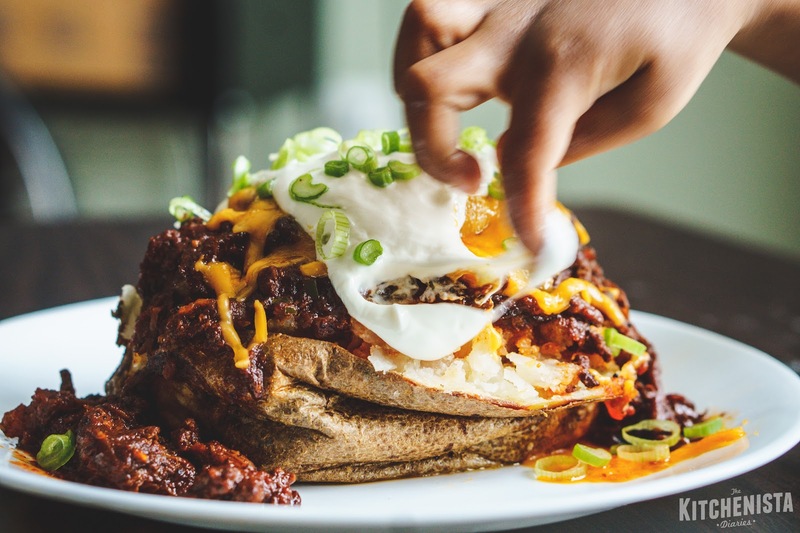 Chili is about as personal as it gets when it comes to home cooking. Everybody has a few special tricks up their sleeve, so I'm sharing mine. I hope this recipe helps you discover your best chili! *Whole 30 substitutions: Liquid coconut aminos can be used in place of soy sauce and 3 to 4 pitted dates can replace brown sugar. Dried chiles can be purchased in most grocery stores these days, but they are also available online if you can't locate any. It's important that your chiles are pliable and leathery; brittle chiles are most likely old and lacking flavor. Tear the dry chiles into small pieces, discarding stems, cores and as many seeds as possible. 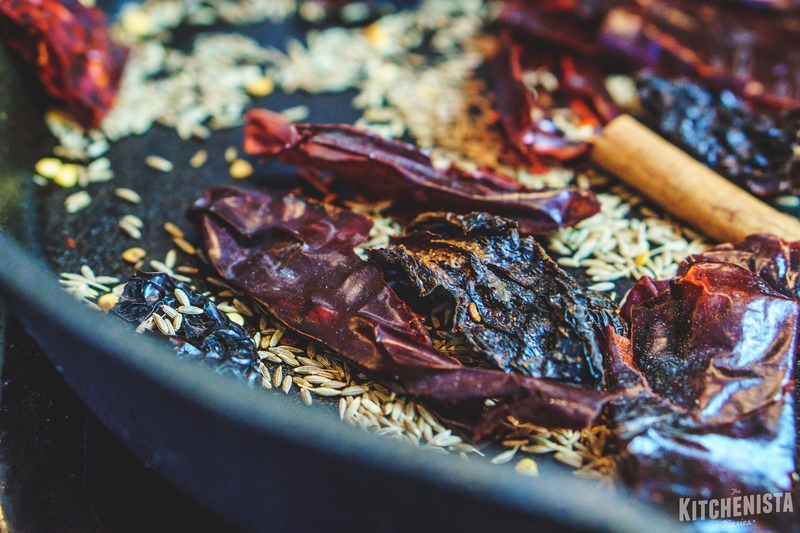 In a hot dry skillet, or your Dutch oven pot, toast the chiles, cumin and coriander for a minute until warm and fragrant, stirring frequently. I also threw my cinnamon sticks in there, but you won't be including them in your chile paste. Toasting chiles and whole spices really helps to bring out their flavors so it's an important step. Note: I use a high powered blender (Vitamix) which is strong enough to pulverize spices. If you're using a food processor or less powerful blender, I recommend grinding the toasted cumin and coriander in your spice grinder first. Then you can add it to the paste with the remaining ingredients. 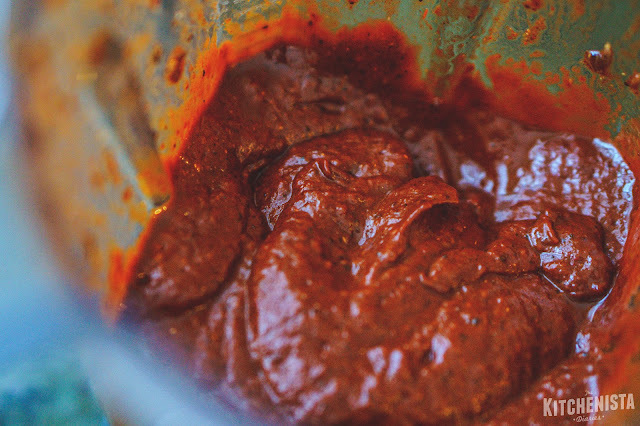 Add the chipotle chiles, anchovies, soy sauce, tomato paste, coffee, cocoa powder, brown sugar, smoked paprika, black pepper, garlic cloves and fresh oregano to the blender. Puree to make a smooth paste. You can taste it just to get a sense of how mild/hot it is if you're nervous about that sort of thing. It's an assertive concoction, but keep in mind flavors will mellow out considerably once simmered with beef and tomatoes. Moving on to the meat, pat the chuck roast dry and season liberally with salt. Add the canola or grape seed oil to your skillet over high heat. Once just shy of smoking, add the chuck roast and sear for several minutes on both sides to develop a deep crust (browned meat equals flavor!) It will take 10 to 15 minutes to brown, total. Using a whole chuck roast as opposed to pre-chopped stew meat makes the browning process much easier. 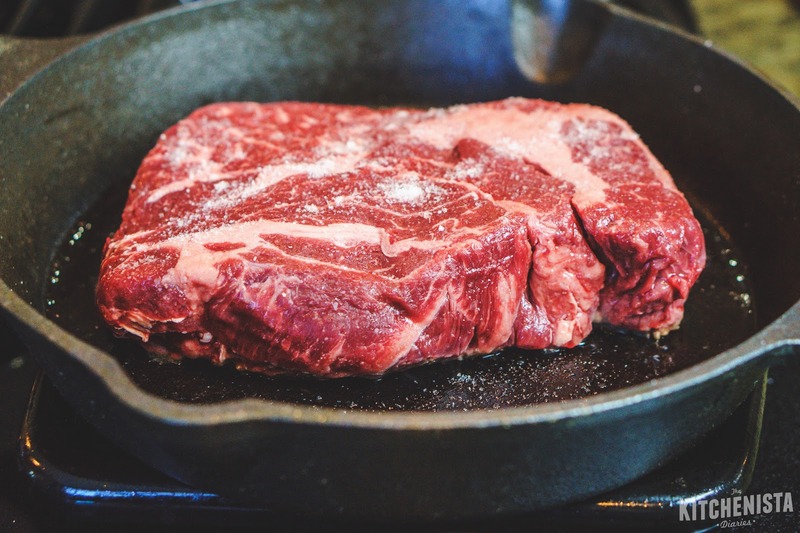 Stew meat is unpredictable, rarely evenly sized and may not all be from the same cut of beef. When you buy a whole roast, you get the benefits of a deep crusty sear and can cube the meat yourself evenly, so it cooks at the same rate without smaller pieces drying out. By the way, this is the same cut you would use for a good pot roast! 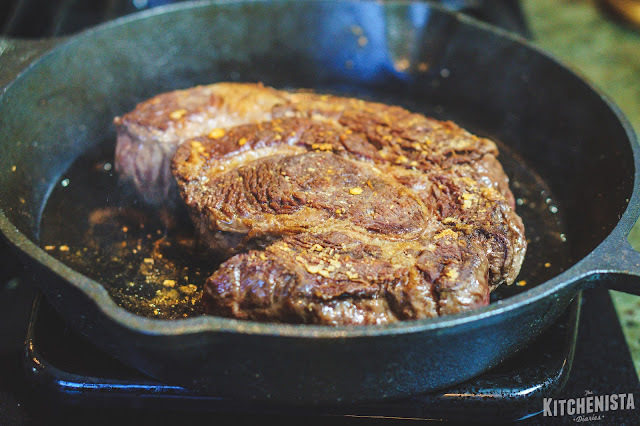 Once the chuck roast is nicely browned, remove it from the skillet and set aside to cool a bit. Next, add the ground chuck to the skillet and cook until there is no visible pink, seasoning with a bit of salt. Use a turkey baster to drain excess grease if necessary. Once the meat has cooked, add diced onions and green peppers. Season with salt. Continue cooking for a few minutes until onions and peppers have softened. 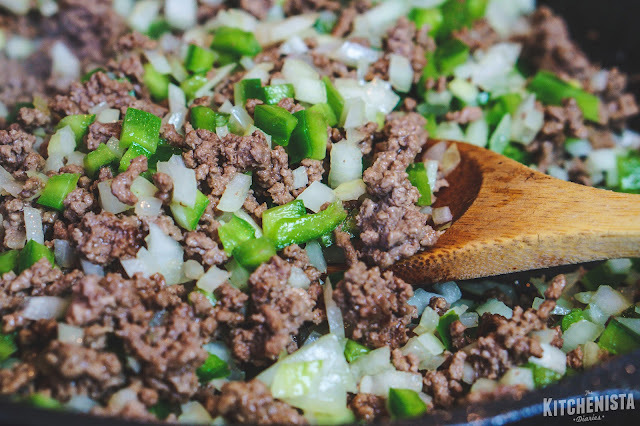 To the ground meat mixture, add the chile paste. Stir for a couple minutes to cook the raw tomato paste and bloom the spices a bit. If you're going to be using a slow cooker, transfer the contents of the skillet now and set the slow cooker to low heat. If you'll be cooking your chili in a Dutch oven pot, you can continue on to the next step leaving the meat here. 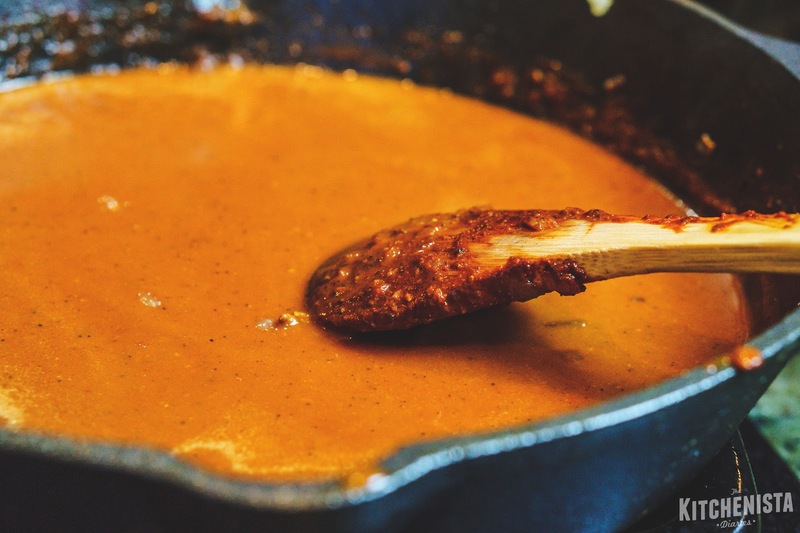 Use the remaining two cups of chicken stock to help rinse out your blender, then pour it into your skillet to deglaze the pan. 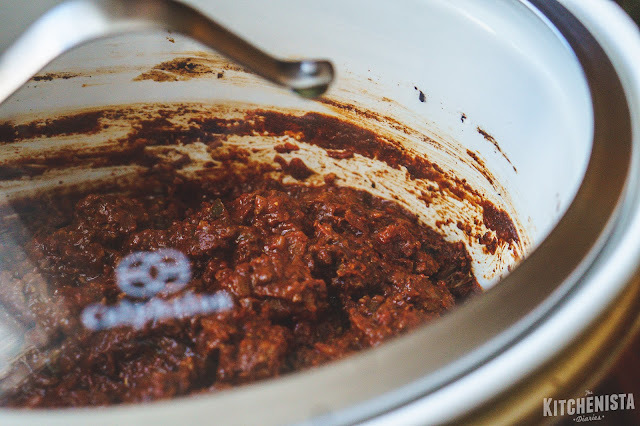 Scrape up any crusty bits stuck to the bottom, then transfer the liquid to your slow cooker. For Dutch ovens, bring the pot up to a gentle boil after adding the remaining stock. Once the ground chuck, chile paste and stock have combined, add the chopped tomatoes, bay leaves and cinnamon sticks. Season to taste with salt, if necessary. Your browned chuck roast should be cool enough to handle by now. Chop it into 2" cubes and add the meat to the chili. Stir to evenly distribute the meat and ensure it's all coated with chili. For slow cookers, cover and set it to cook on low. Plan to check on it after 3 to 4 hours. My slow cooker is a bit on the hot side so I rarely let it go longer than half a day. If you're cooking in a Dutch oven pot, it's best to transfer it to the oven for even cooking. Set your oven to 325° F and place the covered pot on the middle rack; it should take 2 to 3 hours to cook. 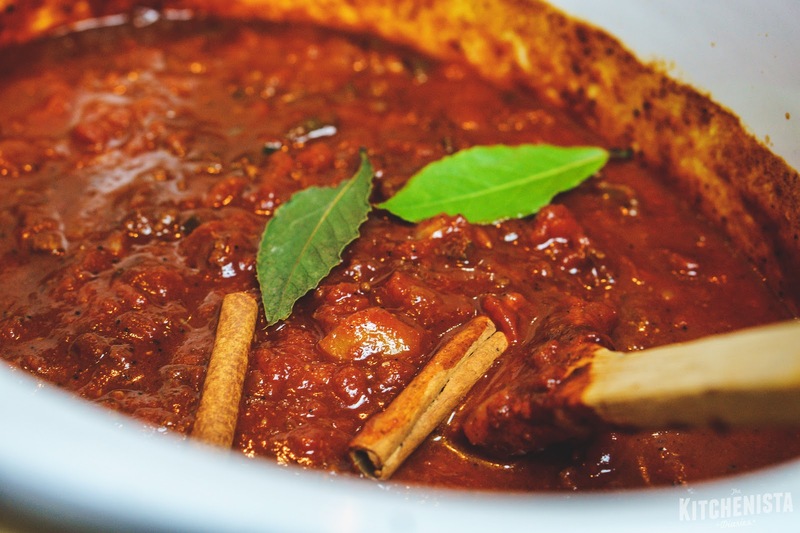 Whether you're cooking in the oven or slow cooker, you want the chili to just barely simmer, not boil; adjust your heat down if necessary. 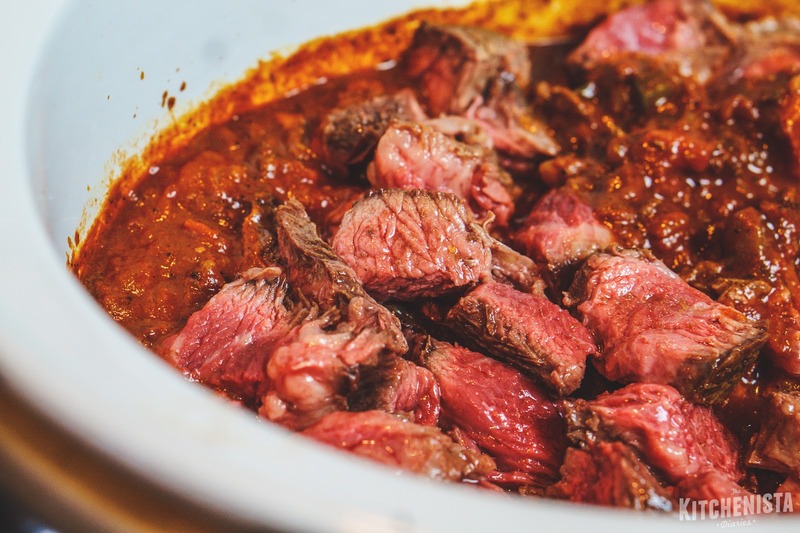 The chili is done when the chuck roast cubes are tender and easily shred with a fork. I can't give you an exact time frame for how long your chili will take, but you'll know when it's done! Don't cook it beyond that or the meat will start to dry out. The easiest way to skim fat from a stew is to let it chill completely. I do that overnight, typically just leaving my whole pot in the fridge or freezer depending on space. When fat cools it will solidify and rise to the top; it can be easily scraped away at that point before gently reheating the chili. Once the fat has been skimmed and chili is reheated, stir in the apple cider vinegar. If you haven't already done so, discard the cinnamon sticks and bay leaves. 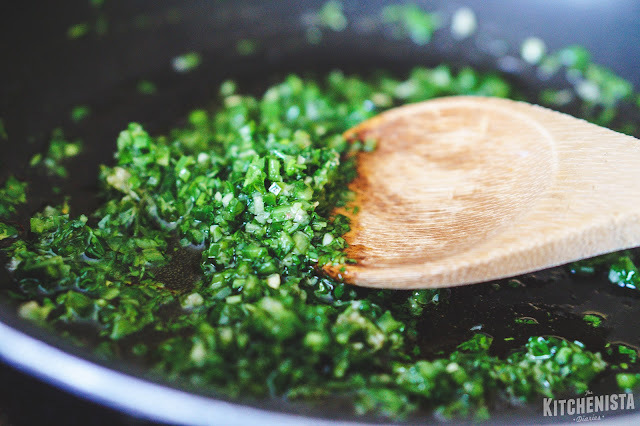 To prepare the sofrito, add olive oil to a small skillet over low heat. Once warmed, add the grated garlic, serrano peppers and cilantro. Stir for a minute until fragrant. Transfer the sofrito to the chili and stir to combine. 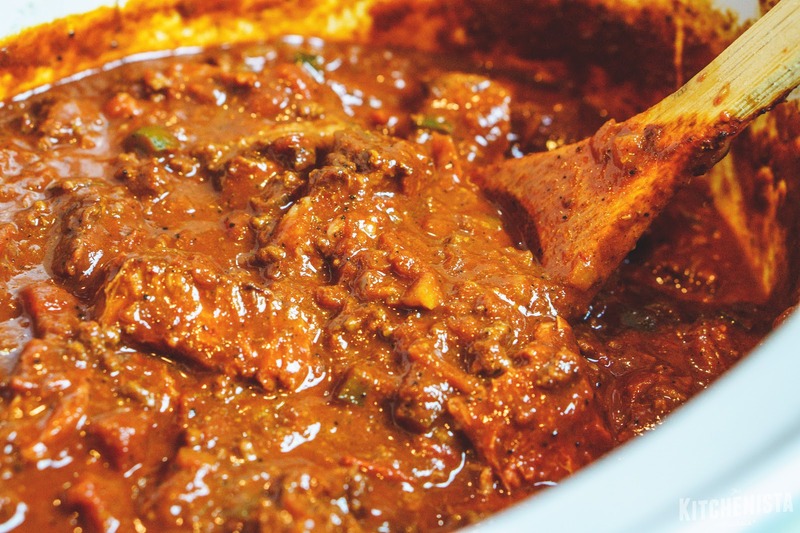 Allow the chili to simmer for ten minutes or so before serving to allow the flavors to meld. Garnish as desired! Some of my favorites are sour cream, scallions, cilantro, avocado, crushed tortilla chips, cheese or diced white onions. Let me know your favorite way to serve chili, or what you do with your leftovers! Am I the only one here? 😎 👓!!!! Today the temp dropped so I pulled out this recipe again. 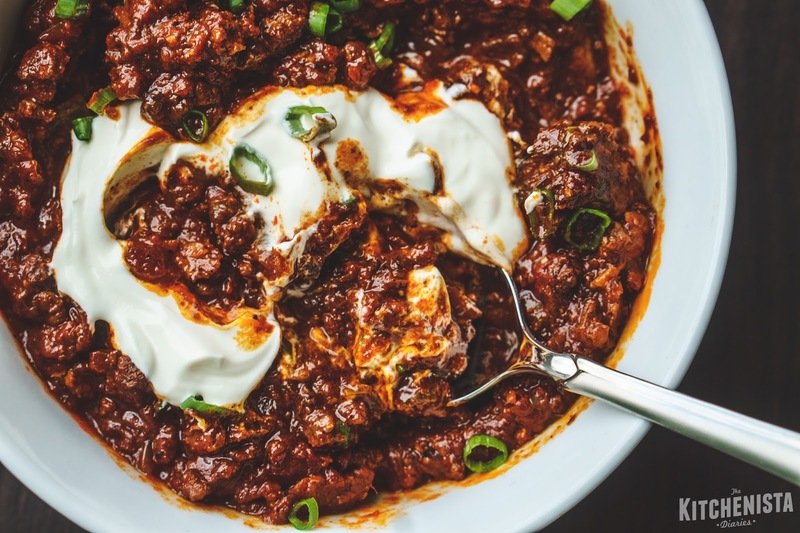 This is my new go-to chili recipe. After making it for the first time over a year ago I can't go back to the old "add chili powder." Building the flavors up using real dried chilis and all those other yummy items (anchovies, coco, coffee, etc.) is amazing. My house is filled with wonderful smells and can't wait to dive in later today. Any ideas for good sides to go with this, beyond the potato? Cornbread? Veggies? Thank you so much for this blog - keep'm coming!